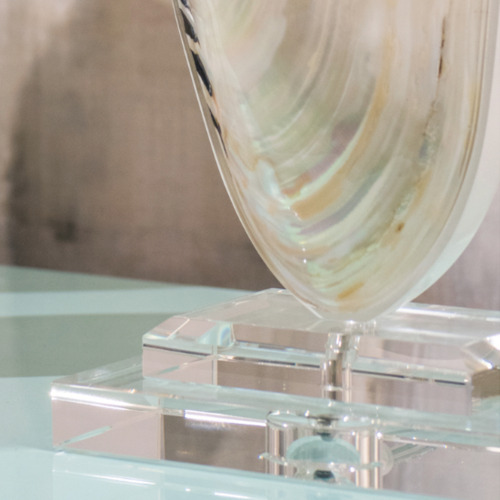 So realistic you can hear the sound of the waves....a natural mother of pearl shell mounted on a nickel metal pole and sits atop a simple rectangular steps of optic crystal. 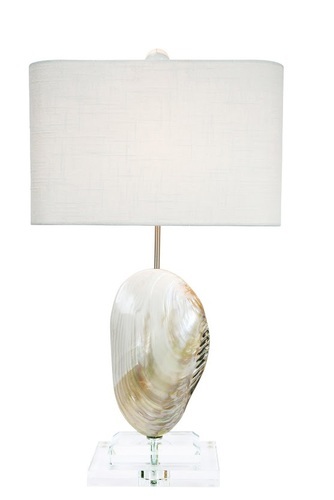 Topped with a white linen hardback shade in a rectangular rounded corner shape measuring 14.5/9" x 9"H. Sculptural illumination for any beach home...naturally. Lamp measures 14"W x 25.5"H.
Due to the natural elements of the mother of pearl, the shape, size and color will vary from piece to piece.